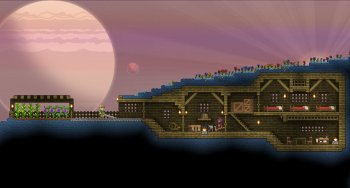 You'll be able to progress in Starbound by dungeon crawling, selling crops, or renting space in your settlements. Those of you deep into the Starbound beta would have discovered that the game's progression is very bare bones at the moment, offering a single quest chain that is more of a jumping off point for exploring and testing the game's features than anything else. Lead designer Tiy has now spoken at length about how progression will work in the game's final build, explaining that there will be three different paths players will be able to take: farming, adventuring and building. "Instead of progressing through the game sector by sector, you'll advance by upgrading your tech to allow you to visit planets that were otherwise inaccessible due to hazards," he explained. "Progression will be less linear and more akin to the kind of progression you find in modern metroidvanias." He went on to further explain the "three paths of progression," saying that they will branch off as the game progresses (for example, animal farming for the farming progression) and all be as equally viable and satisfying as each other because "we want players to be able to advance through the game whilst doing whatever they enjoy most." Farming will work by selling your crops to trading posts, adventuring will work the way your traditional dungeon delver does, by finding treasures hidden in dungeons, and building will allow you to progress by renting out rooms in dwellings and settlements you've constructed. He says that a new planet type called an outpost will soon be added to the game - a small and safe planet populated by members of every race, where players can trade their wares and pick up quests for each progression path.